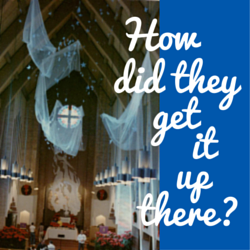 What does a torn curtain mean to the 21st century worshiper? It means that we can be truly reconciled to God. The sin barrier has been broken by the sacrifice of Jesus! He is no longer held hostage by our sin in some little room in anyone’s tent or temple. If we want to, we can go right into the Presence of Almighty God, fearless of death while in awe of His Holiness. Old Testament reconciliation was a thing of death, blood, and sacrifice. Because Jesus was the final lamb, New Testament reconciliation is a thing of life, forgiveness, and repentance—a new way and a living one. We can worship God because we are forgiven. Our sins have been cast away from us as far as the east is from the west. If what Jesus did on the cross is so powerful and so many of us are believers in what He did, why are our worship services sometimes lacking in True Worship? Why is private worship so hard? In the Sermon on the Mount, Jesus linked reconciliation to worship and prayer in a different way. If our offerings of praise and worship are going to get past the ceiling, if they are going to come before the Throne of Almighty God, then we must be free of un-reconciled conflicts with our brothers and sisters. We must see that our praise is meaningless to God if there are issues between us and our brothers and sisters! Time Stops. The Lord is interested in more than just forgiving us. Jesus died so that we can be forgiven and live in the forgiveness of others. When offences come between family members, time stops. If we were injured emotionally as a child, part of us remains a wounded child until the healing power of forgiveness is applied to the wound. I counseled with a man who was punishing his second wife, who had never been unfaithful to him, for the betrayal of his first wife. It was now thirteen years and two children later, but time for him had stopped. He was stuck at that moment of betrayal and was now in danger of losing his family. He had to forgive his first wife, to release her from the life sentence he had given her. Strife in the Body of Christ is crippling to worship and prayer. In the Matthew 5 passage, the worshiper with the gift was the offending party. Time had stopped for him spiritually until he went to seek forgiveness from his brother for his offence. Because of politics, selfishness, and sin in the church, many of us are stuck in time at the moment of some offense. Sometimes we are confused about who is right or wrong. Being right won’t start the clock again. Only reconciliation sets the pendulum in motion again. Meanwhile the Kingdom of God passes us by. God’s clock doesn’t stop for our conflicts. The implication in Matthew 5 is that somewhere another worshiper at another altar, was trying to get through to God in spite of the offence done to him. Time had stopped for him, also, until he forgave the one who had hurt him. In today’s church, both the offender and the offended one–often singing in the same room or praying at the same altar–are stuck until they are reconciled with each other. For them, the curtain of sin still stands between them and God’s Presence. We need the presence of God. As we worship, we must go through the torn curtain of Jesus’ love into the Presence of God, or our religion is just another religion. God has provided for us complete access to His heart, His face, His truth, His love, His forgiveness–all just a few spiritual steps away from us at any time because we have been reconciled to God the Father through Jesus the Son. But if we have hurt someone, willingly or not, or even if they just think we have, and have not asked forgiveness, our praise won’t buy us passage. If we have been hurt and have not forgiven the offender, our prayers will drop to the ground before us and never reach the ears of God. Peter said a husband’s mean spirit toward his wife would hinder his prayers. (I Peter 3:7) Surely this also applies to our brothers and sisters. We have been given a “ministry of reconciliation” according to Paul. When we finally let go and grant forgiveness, we can feel the hand of God reach deep into our hearts and start the clock again. When we seek forgiveness from a brother or sister we have offended, we can feel the curtain fall as the way to God opens up for us again. True revival in a church is always marked by reconciliation of old offences and the healing of long-festering wounds. However, this is not just a result of revival, it is a cause of revival. How much of our praise and worship is refused by the Lord and how many of our requests hindered because we have issues with one another? Bear with each other and forgive whatever grievances you may have one against another. Forgive as the Lord forgave you. The curtain has been torn! The way to God’s presence is standing wide open. Do not let petty differences bar you from making your entrance! 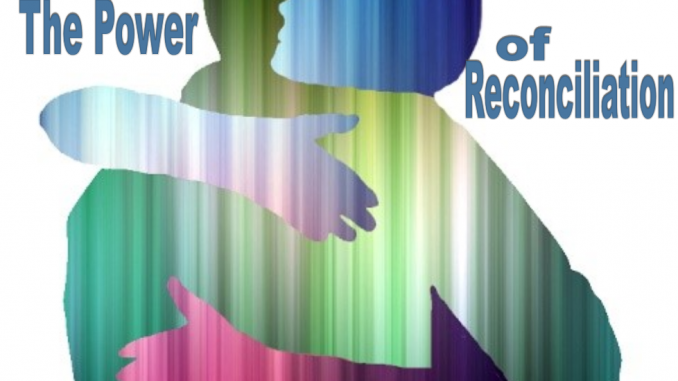 Reconciliation is a power-packed word. Along with the word forgiveness. Your lesson spoke to me and to what I witness around me and in me. I needed exactly what you wrote. Thank you.